Winter, 1564. Beautiful young Princess Margot is summoned to the court of France, where nothing is what it seems and a wrong word can lead to ruin. Known across Europe as Madame la Serpente, Margot’s intimidating mother, Queen Catherine de Médicis, is a powerful force in a country devastated by religious war. Among the crafty nobility of the royal court, Margot learns the intriguing and unspoken rules she must live by to please her poisonous family. Eager to be an obedient daughter, Margot accepts her role as a marriage pawn, even as she is charmed by the powerful, charismatic Duc de Guise. Though Margot's heart belongs to Guise, her hand will be offered to Henri of Navarre, a Huguenot leader and a notorious heretic looking to seal a tenuous truce. But the promised peace is a mirage: her mother's schemes are endless, and her brothers plot vengeance in the streets of Paris. When Margot's wedding devolves into the bloodshed of the St. Bartholomew's Day Massacre, she will be forced to choose between her family and her soul. I fell for Sophie Perinot’s work in 2012 when I read The Sister Queens. I was a young reviewer, but I was struck by the novel’s scope and mesmerized by the author’s command of language and prose. It was her debut piece, but it was captivating and I made a mental note to keep an eye out for her next release. 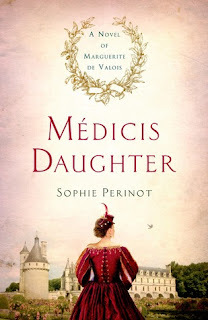 Medicis Daughter hit the market more than three years later, but the novel proved well-worth the wait and cemented Perinot’s place as one of my favorite writers of historic fiction. Atmospherically, the novel swept me off my feet. Perinot’s depiction of the French court was beautifully drawn and I was wholly captivated by both the political and social interaction that unfolded among its players. Margot is young when first introduced, but she is a quick study in an environment that does not make allowances for inexperience. This was an intense game of cat and mouse, a world where you are either predator or prey, and I liked how Perinot was able to illustrate those concepts through her interpretation the Valois’ reign. Margot fascinated me in her own right. She isn’t an easy character, but her layers and complexity are hard to ignore. 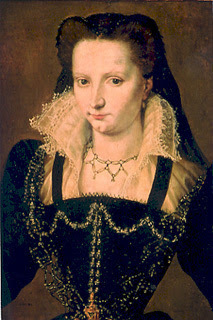 Her family is ruthless and self-serving and while she possesses many of the same characteristics, she plays them much differently and distinguishing herself as a somewhat unique force. Her goals and ambitions are relatively modest, but her loyalties are often at odds. Her courage and tenacity are intriguing and while I didn’t always agree with the course of her actions, I found much admire in the determination and resolve required in carrying them out. Historically speaking that novel covers only part of Margot’s history, but it teases the imagination and feels complete in its telling. Rich with intrigue, rivalry and passion, Medicis Daughter is not to be missed.